Or, she could blog it? Clearly, some sort of itch is being scratched here, probably just the marginal ease of use, informality and chattiness of Twitter pushes it over a tipping point for a lot of teachers (vis a vis blogging). Still... I find it weird. One more win for large pieces tightly joined. "No one knows if turnarounds work," said Andrew Calkins of the Mass Insight Education and Research Institute. "We spent two years looking at turnarounds and could not find a single example of turnaround work that was successful and sustained and done on scale, not just one school." “I looked at the aluminum tube, looked at the analysts and thought, I can go buy one of these at Adler’s Hardware,” the Providence hardware emporium, writes Chafee. Like any short (or long!) description of principles, the CES principles are open to interpretation and vulnerable to willful mis-interpretation. Local discussion and interpretation is key to the implementation of these principles, and there are plenty of related texts to give greater context to the authors' original intent. There is a clear point of view here, but room is intentionally left for local variation. Regarding principle #1, "using one's mind well" is closely associated with the idea of "habits of mind," which a little googling leads me to believe that Sizer lifted from Mortimer Adler. Of course, exactly what habits of mind you value is also up for discussion, but personally I don't think you can do better than Ted Sizer and Deborah Meier's take. Overall, I'm strongly in favor of framing a school's mission as fundamentally intellectual, focused on the student in the present. I think Gary's objection to the "student-as-worker" metaphor in #5 is somewhat different than Vicki's. It leaves open a Dickensian interpretation for Gary, who would probably prefer more of an emphasis on student agency and "play" in contrast to "work." Vicki's objection seems a bit more based on class-anxiety. She's trying to bring up managers, not mill hunkies. Either way, I can't think of a better term. "Student-as-player?" No. "Student-as-doer?" Eh. "Student-as-active-learner?" Too vague. I think if you look at the broader textual context it is pretty clear that "student-as-worker" does not mean "students-mutely-bent-over-their-worksheet-looms." Regarding #10, the simplest answer is that Coalition schools have a broad range of interpretations of what "democratic practices" are, most of which Vicki would find amenable. That's what it takes to throw an off-hand dig on an effort to give poor students access to technology in the context of a post on what rich kids do with unlimited access to tech. When you hire someone whose job you think it is to get you the best loan possible, and their incentives are actually to get you the shittiest loan possible and you are unaware of that fact, there's a wee bit of a problem in the system. And the bigger question, the more frustrating question that many of us kept coming back to throughout the day, is does it scale? I asked Chris last night if Philadelphia is now looking at SLA as a continuing experiment or a model. Without hesitating he said “Oh, god, I hope it’s not a model.” Grrrr… I understand why not, but I think there are a lot of folks here who are looking for those concrete takeaways that help them get from where they are closer to here. And, that are at their core hoping the answer is that it’s just not possible to do without building from ground up. I had the opportunity a few years ago to sit in on a whole series of conversations about scaling up school reform between true heavyweights in the field. My primary takeaway from that experience was that nobody knows how to consistently scale up reforms at even the district level (there are only a handful of good examples), let alone nationally. Since then, a lot of investment has gone into Charter Management Organizations (CMO). Dean Millot recommends Expanding the Reach of Education Reforms and Quantity Counts: The Growth of Charter School Management Organizations for more on these subjects. Both books are available in full for free online. The point is, these are questions that have been heavily explored and researched over the past decade or so. I'm a little unclear on Will's last sentence. Does he mean people would like to be left off the hook by feeling that they can't change an existing school? Or that they would like to hear that change in their school is possible? I'm just not sure. Certainly at least some of the people at the Gates Foundation decided that trying to change existing schools is a lost cause; I don't think there is any doubt that it is harder than starting fresh. Also, I've seen no evidence that creating model schools has any impact whatsoever on the other schools in the district. So I think in particular what Chris is saying when he says "I hope it is not a model" is that imposing the mechanical and textual features of the school wouldn't work. The secret sauce is not here. If you told me my school had to adopt SLA's list of values I'd be like, "Dude, those values aren't even values." But it is something that they came up with for their community, and it works for them, so who am I to quibble. And I think Chris would argue that other schools should find their own way to articulate what they value, not copy theirs. Ultimately, we seem to have painted ourselves into a strategic corner where, given the facts on the ground in US education politics, "Does it scale" has no right answer. All our options are bad ones. Kind of like in Iraq. Tactical success is possible, but the big picture is just FUBAR. ... what? That's the question. The "technology-oriented but not really" ambiguity of EduCon was a strength, in bringing in a distinctly varied but like-minded group of people together. But while the Open Minds conference tells you something about the increasing interest in open source in education, or NECC tells you about the strength of the ed-tech marketplace, I'm unsure about the larger significance of EduCon. I would say it demonstrates the desire of individual teachers to break out of their isolation and learn from each other despite administrative and organizational barriers. But I'm not sure how many people there were just classroom teachers. I would guess less than half. I do think EduCon shows that people like it when people they respect host cheap, informal conferences, and that the web greatly facilitates this process. It demonstrates that social networking technologies are good for networking socially, and we still like to meet people face to face. But I can't pick out a distinct pedagogical agenda, one that not only lacks historical precedent, but I can't find one that doesn't have significant, widespread, foundation-funded contemporary implementations. This isn't a biting criticism; nobody claimed that the objective was a unique revolutionary manifesto. I'm just trying to make some meaning of the thing as a whole. I do have a couple thoughts about where I'd like EduCon to go. It would be great if we had a venue for education speakers that was the equivalent of an after-hours club where jazz musicians go to play the stuff that is too out for their regular nightclub gig, or the little comedy club big names go to to try out new material. At times EduCon had that feel, and those were my favorite parts. I guess the other direction I'd find interesting is to pull in a few more experts from outside the ed-tech network and make it more explicitly about cross-pollinating between the school reform and tech leadership communities. Chris is one of the few people who might have the juice in both worlds to pull that off. Overall, though, I'd call the EduCon a big triumph for Chris, Marcy and the rest of Science Leadership Academy, and more thean anything else, I just hope they can do it again. Replacing a tank gunner who had scored Category IV with one who'd scored Category IIIA (in the 50th to 64th percentile (on the army's aptitude test)) improved the chances of hitting a target by 34 percent. The proximate cause of the bad-for-counterinsurgency recruiting situation is the fact that we're trying to wage a counterinsurgency. Following this link on regional pizza styles from Boing Boing, I wondered if I would finally get a little context for Beto's Pizza in the South Hills of Pittsburgh, which Len Jarabeck periodically took me to. If Trenton can have a style based on a couple places why can't the Ohio Valley? Here, the blog Mine Road describes it: "The first thing that you’ll notice that is odd about our favorite pizza is that it’s square. Square as in it’s made in a square pan and then cut into square pieces. Then you’ll notice that the cheese isn’t melted all the way. The uncooked toppings are put on after the sauce, base cheese (minimal), and dough are cooked. You always have to make sure to have a slice ASAP before everything melts on the drive/walk back to your place. You’ll also notice that our pizza sauce isn’t really much of a sauce at all as much as it is just stewed tomatoes. Also the crust is a mix between a deep dish and thin crust. It is very much focaccia bread, if you’ve ever had that. Oh, and the best part is that you buy it by the slice." But if the congress -- an opposition party led congress responding to a discovery that pierced a years-long executive branch coverup -- accepts this "it's not a crime if the president asks you to do it" theory of legal liability we may as well not have any laws at all. Rockefeller defended the actions of the telecom companies, arguing that the companies received explicit orders from the National Security Agency to cooperate with the super-secret surveillance effort. The West Virginia Democrat said the telecom companies were being "pushed by the government, compelled by the government, required by the government to do this. And I think in the end, we'll prevail." Can someone please tell Jay Rockefeller that we don't actually live in a country where the President has the definitively dictatorial power to "compel" and "require" private actors to break the law by "ordering" them to do so? Like all other lawbreakers, telecoms broke the law because they chose to, and profited greatly as a result. That telecoms had an option is too obvious to require proof, but conclusive proof can be found in the fact that some telecoms did refuse to comply on the grounds that doing so was against the law. There is a branch of Government that does have the power to compel and require behavior by private actors. It's called "the American people," acting through their Congress, who democratically enact laws regulating that behavior. And the American people enacted multiple laws making it illegal (.pdf) for telecoms, in absence of a warrant, to enable Government spying on their customers and to turn over private data. Rockefeller's claimed belief that we live in a country where private companies are "compelled" to obey orders to break the law is either indescribably authoritarian or disgustingly dishonest -- probably both. Stephenson said that he had not yet decided to filter traffic on AT&T's lines, but suggested he was seriously considering doing so because a great deal of peer-to-peer file-sharing data on the Internet was illegal -- and, therefore, AT&T had a duty to stop it. Here's how he put it: "It's like being in a store and watching someone steal a DVD. Do you act?" Stephenson asked. So there you have it, AT&T's picture of digital communications circa 2008: The Internet is one big movie shop, any one of us is capable of stealing Hollywood's precious moving images, and only AT&T can stop the madness -- and only by searching our bags. It has been both informative and enlightening to read all the insightful analysis of the recent potentially epochal events in the global economy from all the futurists who travel the country explaining how you should change your school's curriculum to match their predictions. There is some good stuff in my Shared Items, though. "But how shall I find time to follow out even one of these exercises?" objects the victim of American social life. It is true, he cannot. We live so fast that we have no time to live. Nevertheless, gymnastics have one advantage adapted to our hurried habits. They afford the most exercise in the shortest time. In no other way, so easily accessible, can as much powerful motion be used in so brief a space. The tired clerk or merchant comes home late, with feverish brain and weary legs. His chest and arms have had no exercise proportional to the rest of his system. What shall he do to restore the balance? If he can, let him erect in some upper room, away from furnace-heat, instead of a billiard-table, a private shrine to Apollo or Mercury. He will need but little apparatus. A set of weights and pulleys, a pair of parallel bars, two suspended rings, and a leaping-pole are all the necessary permanent fixtures. Other articles, as the dumb-bells, the Indian club, boxing gloves, foils, or single-sticks, take up no room, and can be added as his growing taste for their use demands. We would single out the parallel bars and the weights as the most generally useful. The former develop particularly the chest, stretch the pectoral muscles, and lengthen the collar-bones. The latter increase the volume and power of the extensors of the shoulder, arm, and forearm, and are to be sedulously practiced, because we have fewer common and daily movements of these muscles than of their antagonists, the flexors, and they are consequently weaker in most persons. The windows should be widely opened, and the room warmed by the sun alone. Though, after the first few trials, the whole body will ache, and the astonished muscles tremble with soreness, a week's perseverance will overcome these earlier drawbacks. The gymnast will be surprised at the new feeling of vigor in the back and shoulders, and to find the upright, military posture as natural as it was before difficult to maintain. Temper and digestion undergo a parallel improvement, and it will require much to make him forego the luxury of exercise which he at first thought so painful. Many persons become discouraged by beginning too violently. Alarmed at the fatigue and suffering at first induced, they shrink from further efforts. Gymnastics are, to be sure, an injudicious mode of exercise for some. Children get a good many sprains, and sometimes permanent deformity, from their use. The growing period requires care to avoid injuring the articulations; yet it is the most favorable time to spread the shoulders and deepen the chest. The young grow most in height and can best gain an harmonious development by frequenting the GYMNASIUM. I'm about half way through cleaning up our attic gymnasium, which is frighteningly similar in composition to the one described here, except for the addition of a modern safety bicycle. I noticed a fellow named Gary Becker is speaking at FETC on copyright. Since he's been consulting with schools on the issue since 1975, I figured he must be one of the people responsible for schools and teachers being so misinformed on the issue. It is not so much that this stuff is factually incorrect, but it is only one side of the story, and it is not the teacher's side. It is like having a union convention where corporate lawyers give all the presentations on labor law. This FAQ, at least, indicates an extremely narrow interpretation of fair use. Also, the combination of instructional and non-instructional use cases is confusing, I think. The instructional uses are complicated enough and munging in non-instructional ones as well will only lead to a more conservative impression of the law. I hadn't realized they'd already made that long of a commitment. It would be interesting to go back and see if that announcement preceded their increase in cheap XP licenses to the developing world. It is hard to underestimate how much of a drag this is on Microsoft. Maintaining backwards compatibility is a massive pain in software development. SchoolTool has essentially dropped the open source axiom of "release early and often" because maintaining backward compatibility with early releases being used by a dozen people is just crippling for a small development team. Of course, Microsoft has lots of money and developers, but also vastly more complex software, so it is still a big burden. Just for comparison, imagine if Apple supported Mac OS 9 for seven years after the release of Mac OS X. They would be phasing out OS 9 support this spring. Can you imagine Apple limiting themselves to features that would work on both versions? No. Can you imagine them adding features to OS 9 all this time? No. Can you imagine them maintaining two separate versions of all their apps? No. Microsoft is facing that choice for six more years. My request for a development "active antenna" like is used on the OLPC servers was approved, so I should be getting one of those in a few weeks. Ideally I'd have a small, silent, low-power box to connect it to. Anyone have a Mac Mini they're looking to sell, cheap? Any other ideas? Trying to get the USB2VGA adapter to work has been kind of a non-starter. I mean, it should work, the main hurdle being compiling the module which is already in the standard tree but not included with the XO build which is, understandably, rather stripped down. I actually switched my desktop to Fedora to make the process easier, but the instructions on the wiki just aren't working for me. I'll try to get some help on IRC during business hours tomorrow. One other thing I noticed while browsing the web on my new Fedora box tonight. Firefox on my regular PC running Fedora seems to have some of the same problems as it does on my XO (also based on Fedora). That is, hitting certain scripts and grinding to a halt, although my PC can recover much more quickly than the XO. But Firefox on Ubuntu doesn't seem to have the same problem. Open Source Game Development: Partnering with Whom? PETLab’s prototyping efforts focus not only on XNA/XBOX but on a wide range of gaming and design platforms, some commercial, some open source, some somewhere in-between. We are interested in developing relationships with a diverse set of companies and organizations in an effort to understand how pro-social themed games can enable different forms of learning. The problem is that, while open source software development is deeply collaborative, the only thing you're going to get from your "partners" is code and maybe some moral support. You aren't going to get cash money. Microsoft will give you money. EA will give you money. The Python Foundation? Not so much. These projects are as dependent on income as any business; they have to chase the money. The reason I nag about this stuff is not because I think it is clever or charming, but because in the long run there will have to be a reckoning. At some point, the foundations have to realize that it is a bad deal for them to underwrite projects based on proprietary software, even though corporations are willing to pick up some of the up front cost. One of the reasons I'm having a little trouble taking simple pleasure in using my XO is because how that plays out, and in particular whether or not Sugar really works, will have a huge impact on how quickly this change happens. It is easy to imagine in three, for or five years people looking back at this period and seeing on one hand, MacArthur's investment in Second Life (unlikely to still be important), the XBox (third place gaming system), and various other forgotten non-commercial, non-free projects, and on the other hand, the OLPC Foundation's investment in Sugar and a subsequently explosive ecosystem of free software from around the world. Hopefully it will be obvious who is the model for the future. The possibilities just magnify my anxiety about Sugar's evident warts. Later... It occurs to me that I should note Red Hat's investment in OLPC and Sugar. There are many examples of corporations contributing to open source development in general, however, there is no open source gaming industry, so it is particularly unlikely to happen in gaming research. It seems to me that in the 20th century, when a recession was coming on the federal government provided money to state and local governments to cushion the shock of decreased tax income. This didn't happen post-9/11 and it doesn't seem to be on the table now. Certainly Providence's budget has been tight throughout; even during the bubble-fed boom, the schools have seen significant program cuts. As a new recession begins, we're already slipping far into the red at both the state and local levels, and I don't even know at what point dropping property valuations start to lower property tax revenues (the main source of school funding in the US for those of you living in more rational parts of the world). Another answer is for the government to spend the money directly — or simply refrain from spending cuts that would otherwise happen. For example, state and local governments, which aren’t supposed to run deficits, may be forced to slash spending in a recession; aid to these governments can avert these spending cuts, which is a real plus for the economy. All of this suggests that if you want a stimulus plan to actually affect demand, it should focus on people likely to be liquidity constrained and on sustaining government spending. Since we're really talking about preventing cuts rather than starting new programs, there is no delay in coming up with ways to spend the money. It is the right way to do stimulus. Has it been two years since I started the reverse Google bomb to knock martinlutherking dot org out of the top slot of search results for "martin luther king?" At this point, martinlutherking dot org comes in at 3rd, which is a heck of a lot better than first. Wikipedia is in the top slot, and it is very difficult to see that changing. On the other hand, martinlutherking dot org seems pretty solid in its spot now. link:www.martinlutherking.org reveals mostly actual white supremacists linking to the site, rather than clueless educational technology consultants, so it would be difficult to further knock down the number of incoming links, although TECHlearning makes the first page of incoming links. Surely an education system based on market principles would have its shortcomings, wrong turns, cases of bad judgment, and disasters. But while the reformers inside the Department of Defense and military services gathered in strength over 20 years to win their "opportunities to excel," the community of market-based education reformers grew as fragmented cults. Looking at them as a collective force for markets, their vulnerablity to destruction in detail is painfully obvious. The charter movement is financially propped up by a few foundations and artificially unified. Vouchers are the market movement's political albatross. NCLB II threatens the stability of an emerging but marginal school improvement industry. The school improvement industry itself is highly fragmented on several dimensions I have discussed many times. When all is said and done, there's been no expanding movement of folks who were high school principals and small city superintendents in 1990 now running big urban districts - or any districts - who are implementing reform lessons learned from their experience in the front lines of urban education. This is at least one reason why, despite NCLB I, Margaret Spellings and Rod Paige are no Don Rumsfeld, and why - you name your Chief State School Officer, or district Superintendent from the past 20 years with a great reform plan hasn't been either. Similarly, the relationship between the eduwonk and the educator isn't close to that between the defense intellectual and the warrior. If a defense intellectual recycled an argument about the need for a strike force based on small, highly mobile forces armed with precision munitions, and it somehow got past the editor of Army Times last week, the readers' response would be "that argument is so 1990's. We've got the right warfighting structure. The problem is that neither this Army nor the one it replaced was designed for occupation, insurgency or civil war." When Ed Week feels comfortable trotting out Doyle's solid, but very old well-worn, argument as somehow, something new for its readers to think about - that tells us something about the editors, the audience. Specifically - how far our market reform ideas haven't come, how little purchase they have gained within the "educator corps," how much what has happened in the way of market reform has been imposed on the system from without rather than evolved from within. I predict there will be no wave of letters to the editor of Ed Week from superintendents and chief state school officers protesting that for the last ten years, they've been doing what Doyle advocates. I don't think I can sum up the exact parts of this analysis I agree with and disagree with -- it's a pretty complicated mesh -- but I definitely recommend giving it a read. The reason I'm using this list is not just that I find it agreeable, but because these principles are of particular historical significance. These principles coalesced circa 1984 from Ted Sizer's A Study of High Schools. The individual ideas were not, in themselves, completely new or original, but my understanding is that this packaging and contextualization of them was a turning point in the discourse on school reform in the US, that almost all progressive reform here can trace its lineage back to these ideas, and a sizable chunk of mainstream thought on the subject can as well. If this list has not changed the reality of American schools, it certainly changed the conversation. So one question for you, gentle reader is: Is there another post-Dewey expression of principles for school design and reform that the CES principles are derived from? I am, for better or worse, talking about a short list or statement of principles. I've also looked up some subsequent similar statements. All of these are in super-abbreviated form; follow the links for more detail. The Big Picture Company "10 Distinguishers:"
Looking through this material has elped me work out the explanation of the diminished role, or at least profile, of the Coalition of Essential Schools (CES) today. CES is, well, a loose coalition of schools working toward a set of principles, individually and in collaboration. Today's "accountability" environment encourages a much greater sense of urgency. Some of the Coalition schools evolved into "Charter Management Organizations (CMO's)," which deliver their designs to districts or charters as a product. There are other CMO's as well, of course, which strike a different tone. I'm not, by the way, going to slog through all this crap in my session. Consider this background material. Am I supposed to put this on the wiki somewhere, Chris? I agree with Vicki on the substance here. I'd just like to point out that once you strip away the undesirable "social" parts of "social networking" for schools, you end up exactly where we were in, say, 2003, except with a few more insights into usability. In fact, I think the vision (in primary and secondary schools!) is essentially the same as the portal visions we were having around the turn of the century, or the 90's groupware vision. You probably need to toss in digital portfolios, which have been around for the whole process, at least in theory. We are actually getting closer to having something usable through natural selection. It is just a bit wearing to repeatedly sit through the cycle of having each new buzzword created, assimilated and neutered, while the software available to schools gets better really, really slowly. I took my second of three classes in letterpress printing at the AS220 Print Shop. 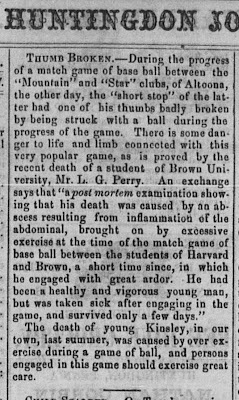 It has been an entirely pleasant experience, reconnecting a bit with my inner hipster while improving my capacity to create accurate 19th century base ball ephemera. In EVE, I've joined the Minmatar Ship Construction Services corporation, which is part of the Ushra'Kahn alliance. By EVE standards, this is a role-playing alliance, although role-playing is very weak in general in Eve, so this basically means that we generally fight our Amarr oppressors rather than whichever random folk we get into a beef with. The annual report contest is not the main thrust of my post. It is a supporting detail. It is also possible that I’m making too much of a connection between your philosophical blogging and pedagogical philosophy and practice. That is, I don’t care what you and your peers do for fun, but I’m interested in teaching and learning, and I’m an English teacher. So when a math teacher starts talking about teaching “storytelling,” he’s coming into the English teacher’s wheelhouse, and if his definition of “storytelling” is very different than what is used in humanities education, well, that deserves some analysis. This is explicitly and intentionally about a manipulative author using narrative as a persuasive technique. There is a place for this, but I would argue that it is not central. Students should understand this approach, but it is dangerous, because ultimately it is not about truth or, at least, accuracy. xochat.org is trundling along. Dying about once a week. It sometimes takes me a while to notice this. Until it is moved to a real server, which is just a question of how long it takes to prod along my volunteer sys admin to move it to a new donated server, it is not going to be very reliable. Basically, this means it is fine for getting a general idea of how collaboration works on the XO, but not useful for getting any sense of the reliability or performance of said collaboration. The schools that OLPC seeks to reach generally don't have the resources Teemu recommends, probably with limited supplies of paper and pencils, let alone art supplies and musical instruments. Of course, one can argue that they should have them, but then in practice arguing that it would be more cost effective to distribute a volume of paper, art supplies, musical instruments, blocks, scientific instruments and supplies, books, etc. to schools in the developing world than to give them computers. I don't believe this. What makes a well designed programmable computer unique among educational resources is that it is one device can fill in all these roles and more, and with free software, add new functions at no marginal cost. The XO is a musical instrument that can mimic almost any other, an infinitely thick drawing pad, a camera, a phone, a book, a typewriter, a calculator, an oscilloscope, etc., etc. It may do each of these things less well than a dedicated device, but schools it is designed for simply cannot afford all those tools and resources. I find it completely baffling and depressing that this point has to be made to an instructional designer in 2008. I’ve lost my mind a bit lately, and I’m certainly losing sleep, sensing some grand unifying theory creeping behind me, creeping behind every high school discipline, behind everything I’ve ever learned or taught. This design thing is just too abstract, I think. It’s awesome but too easy for me to toss out there on my blog and retreat behind, simply because I own a copy of Photoshop and know how to use grids. But what do the teachers who don’t have any training, amateur or otherwise, or own functional software do? I’ve realized now that more important than design — what, in fact, consumes design — is storytelling. I think the word Dan may be reaching for here is actually "marketing". "Storytelling" is a tricky word. Like many words popular with bloggers, it doesn't mean much. It evokes archetypes: the campfire, the wandering bard, Homer, your grandmother. There is certainly a lot of good work done around "storytelling" in schools, which emphasizes connecting with the oral tradition, students making meaning from their own personal experiences, and direct connections with history and others in one's community. In a much broader sense, our discourse is suffused with and dominated by storytelling -- narrative -- which shapes the way we see ourselves and the world in commercial terms. In America circa 2008, when someone is trying to write a story, more often than not, they're trying to figure out how to market something. And if the author isn't trying to sell, someone else trying to figure out how to use the author's work to sell something. When David says he needs to find "the new story," he really means "the new pitch." This is no sin; he's rather explicitly in the business of selling ideas, in fact, that we're moving to an economy based on ideas is part of his pitch, isn't it? In this context, Dan's "Annual Report" contest, creeps me out. Do we need to be encouraged to evaluate our lives as if we were corporations? Do we benefit from identifying with corporations, of thinking of ourselves as a kind of corporation? Do we need further encouragement to define ourselves in terms of quantified income and a mass of consumption habits? I think not. At the moment Zucker blew in and interrupted, I had been in Corvo's office to propose a series of stories about al-Qaeda, which was just emerging as a suspect in the attacks. While well known in security circles and among journalists who tried to cover international Islamist movements, al-Qaeda as a terrorist organization and a story line was still obscure in the early days after September 11. It had occurred to me and a number of other journalists that a core mission of NBC News would now be to explain, even belatedly, the origins and significance of these organizations. But Zucker insisted that Dateline stay focused on the firefighters. The story of firefighters trapped in the crumbling towers, Zucker said, was the emotional center of this whole event. Corvo enthusiastically agreed. "Maybe," said Zucker, "we ought to do a series of specials on firehouses where we just ride along with our cameras. Like the show Cops, only with firefighters." He told Corvo he could make room in the prime-time lineup for firefighters, but then smiled at me and said, in effect, that he had no time for any subtitled interviews with jihadists raging about Palestine. If, as teachers, we're digging down to get in touch with core principles, we need to be looking for truth-telling, not story-telling. I have yet to hear a compelling argument for why social network sites (or networking ones) should be used in the classroom. Those tools are primarily about socializing, with media and information sharing there to prop up the socialization process (much status is gained from knowing about the cool new thing). I haven't even heard of a good reason why social network site features should be used in the classroom. What is the value of knowing who is friends with who or creating a profile when you already know all of your classmates? This not to say that technology doesn't belong in the classroom.... But why social network sites? To the degree that they support blogging and group sharing, sure... but that's not the key point of them at all. They key features that make them unique are: profiles plus visible, articulated and surfable friends' lists. I simply don't get why these are of value in the classroom. The network begins at home. Isn't there MUCH more we can do to make the existing learning environments more social, collaborative and meaningful whether electricity is involved or not? Why do we constantly jump from melodramatic tales of school to some utopian world of online alchemy? It may be ill-advised to project onto children or the educational system an adult's excitement about how social networks have reduced their sense of isolation, answered a tech-support question or even helped shape their personal identity. I'm sure there is a technical term for this that I can't think of, but it is important to remember that both Intel and Microsoft are accustomed to controlling their overlapping marketplace. For quite a while they've more or less been able to dictate what PC's will be built (moreso Microsoft than Intel), by whom, how they will be sold, etc. They don't want to have to respond. They want to set the terms. That power is slowly slipping away from them. To recap. Negroponte sez they're working with Microsoft to put out an XO that will dual boot either Linux or Windows. Microsoft denies it. Ivan Krstić explains OLPC's side. OLPC has from the beginning shared specifications and test machines with Microsoft. Microsoft is and has been working on a version of XP for the XO. Dual booting is not a technical problem, at all. What we are looking at is wrangling around licensing. The flip side of not understanding software freedom is not understanding software unfreedom. In all probability, Microsoft will be willing to give Windows licenses to countries in the developing world to run their software on student XO's at very little or no cost. The question is, under what terms will those licenses be given, and there is no real limit to what Microsoft could ask for. For example, they could, and it is looking like they will, demand that the XO's running Windows will not dual boot Linux. That is, they could make that a condition of the low-cost license. Whatever licensing deal Microsoft offers, it won't be a deal with OLPC, but with the purchasing country. OLPC's leverage here is somewhat limited. Most people who blog about OLPC seem to start and end with the assumption that Negroponte is essentially out of control, just a raving, egomaniacal liar. Virtually insane. Let's assume, just for the sake of argument, that he's a rational, informed actor. Why would he have said that Microsoft would allow dual-booting if he knew, in fact, that they have no intention of doing so? Perhaps to get their position on the record, to force them to publicly refute that assertion. An XO that dual boots Linux (Sugar) or Windows is exactly as much of a threat to OLPC as dual booting Macs has been to Apple. That is, no threat at all. In the long run, Windows can't win on the XO, because OLPC's Linux distribution will keep getting better, and Microsoft cannot continue to improve XP, won't be able to run Vista on the XO, and they can't continue to support XP into the Vista+1 era. They can probably support two versions of Windows, but not three indefinitely. Dual booting would sell more XO's, as it has sold more Macs, and it will ultimately produce more devoted Sugar/Linux users, as it has created more Mac users. Just remember that the difference between the two scenarios is that Windows makes a healthy profit off each boxed copy of Windows it sells to Mac users. If they're giving away Windows on the XO, it is a different equation. We’re jointly making it possible to install XP on an arbitrary XO — subject to the constraints of the Bitfrost theft deterrence system — and then convert the machine back to Linux easily. I have made it clear that the XP port will not receive my security signoff without this Linux rollback feature, and have no reason to believe it won’t be implemented. This is OLPC's fallback position, although I'm not sure how potent a weapon the "security signoff" is. By my reading, their more aggressive maneuver is to make countries aware ahead of time the terms that Microsoft may impose on them, to get them thinking well in advance of the dealmaking. I'm changing the DNS hosting for tuttlesvc.org today, which you shouldn't notice unless I've screwed it up. If you've read this blog long, you'll note I regularly lapse into hopelessly technical comments without making much effort to explain the issues to my less geeky readers. Well, I'm making a rare attempt to do so here, and I'm reminded of why I generally don't bother. This took me three days, it is incredibly long, and I'm not very confident it makes any sense. If you want, you can skip to the bullet points at the end. I've been trying to stick to using Sugar and the standard sugarized apps on my XO, but in order to subjectively experiment with the sources of XO's admittedly show performance in some areas, I installed Xfce, a lightweight window manager used in Xubuntu and other Linux distribtions, and Firefox, a popular, if porcine by XO standards, web browser. This did not require a flash of insight on my point, it is well trod and reasonably well documented territory. That Xfce is more responsive than Sugar is not in the least surprising. The most obvious reason for this is that Sugar is written in Python, whereas Xfce is apparently written in C++. Put more generally, Sugar uses an interpreted language, and Xfce is written in a compiled language. If a computer executing a compiled program is like reading a foreign novel in translation; then running a program in an interpreted language is like reading a novel in a foreign language and translating it in your head. In most cases, it is a lot slower to translate in your head on the fly; programs in interpreted languages are usually a lot slower than the equivalent in a compiled language. If you'd gotten 10 programmers together two years ago and told them you wanted to write a new desktop interface and you wanted to do it in Python, probably eight of them would tell you you're crazy, Python would be too slow, and you should do it in some variant on C. That's how it has been done in every case I'm aware of (Macs = Objective C, Windows = C++ & C#, Linux = C & C++). So why use Python for Sugar? There are some reasons that fit with the philosophy of the project: it is completely free and unencumbered from IP threat or confusion; it hits a sweet spot where it is a good first language for kids and used for big professional projects; Red Hat in particular has experienced Python programmers. But in the wider case, you use a scripting or agile language like Python to trade development time for performance. That is, all things being equal, your developers will be able to write, modify and improve the programs much more quickly, but the software will generally run more slowly. With fast processors, this is a good tradeoff. If Audacity (written in Python) takes 6 seconds to launch instead of three, but it has the features you want as a user, you're ok with that. With Sugar controlling the whole UI and a low-power processor, it is kind of painful right now, though. Quickly achieve the basic functionality you want in Python without regard for performance. If the application is too slow, use profiling tools to determine where the bottlenecks are. Optimize your Python code to eliminate bottlenecks. If you can't fix the bottlenecks in Python, write enough C to get rid of them. This is the basic procedure we use for SchoolTool, although we've never had to resort to writing C. In particular, our developers at Programmers of Vilnius are real sticklers for this concept. It is not unusual for me to find some new feature takes, say, 20 seconds to generate a web response. I say "OK, this does what we need but it is way too slow." Usually by the next day it is 10 or 20 times faster. In particular, this approach pays off if the initial implementation doesn't do what we need it to do, or we discover our initial design was wrong. Then we've avoided spending time optimizing a design which is going to be discarded or heavily modified. It is really a strategy for continuous prototyping and tight feedback loops. My interpretation of Sugar, writ large, is that it is primarily still in step one of the above process. It is, essentially, unoptimized. If you look at the OLPC bugtracker, there are only a handful of bugs tagged with "performance." Bug 5228, "launching activities is slow" gives you an idea of what the process of optimizing these issues is like (in this case for the Update.2 release, due in March. Beyond that, if you look at the development roadmap, you see additional feature-oriented releases, but not a performance-oriented one. It isn't clear when they're going to stop making new stuff and make what they've got faster. I think, and I can't say I've actually dug around the code to prove this (and I'm not competent to determine this myself anyhow), that there is a lot of potential for speeding up Sugar. I just don't know who is going to do it and when. It is also important to note that the relative slowness of Sugar is probably less of an issue to OLPC's target audience. If Sugar is kind of slow, but tolerable, I don't think kids in the developing world will reject it. The same may not be true in the developed world, where kids have more alternatives. One more specific observation from experimenting with Firefox and Xfce is that Firefox runs noticeably more slowly when launched from the terminal in Sugar than it does in Xfce, suggesting that Sugar slows down everything when it is being used, even compiled C programs that aren't "Sugarized." Bugs 4680 (fix) and 4912 are examples of bugs that would have that effect. The XO hardware doesn't have any particular performance problems. It is as fast (and slow) as you'd expect from its specification. Given a more typical UI, it performs typically. There is good reason to expect that the performance of Sugar can and will improve dramatically, if time and money is put into that goal. As she pointed out, the Classmate was never intended to be an Intel-branded device. It is, instead a design specification for a laptop to be used in educational settings, particularly in developing countries. She also noted that, while the spec uses Intel processors, local OEMs would be free to use chipsets from other manufacturers and customize the design to suit the needs of a particular locale. So right now Intel is producing these things at a loss, and at any time they can walk away and say "Hey, it is just a reference implementation, someone else has to make them for real." Of course, doing that at a profit may be a challenge. X-Box hacker and Chumby creator Bunnie Huang has a review of the internal electronics and industrial design of the XO. He's impressed. Brian Jepson has a pretty thorough explanation of how to update your XO, particularly if you'd like to keep a stable and development build on the system at the same time. Basically, the XO is designed to retain two working OS's, generally the current one and the previous one, but if you're careful you can do other tricks. Actually, it is more accurate to say that by default it will keep up to four versions of the OS, because it retains a "pristine" version of each build as originally installed separate from any OS changes you subsequently make. This is, obviously, built in, redundant disaster recovery, running in the background all the time. Handy. Brian's HOWTO uses some of the XO's boot "cheat codes," which are more fully documented on the OLPC Wiki, and also handy. Scholes sees reading as the production of text within text. It’s the largely unconscious process we use to access the author’s message. While reading, we engage the generic and cultural codes used by the author. Vocabulary knowledge, discussion, description, and background knowledge all contribute to a reader’s ability to construct a text by entering the author’s world. Interpretation is the production of text upon text, and Scholes see this activity as dependent upon breakdowns in communication. When we perceive a message as somehow incomplete, we employ “fix-up” strategies to help us make sense. Scholes notes that we’re motivated toward interpretive activity by “either some excess of meaning in a text or of some deficiency of knowledge in the reader (p. 22).” The impulse to understand, to look for meaning, is basic to literary analysis. The production of text against text happens when we believe that a work has not lived up to its intended purpose. Criticism springs from an interest that is not just simply personal, but which is rooted in particular social texts with which a reader/critic may feel a close affinity. Scholes observes that criticism is in some ways the reverse of interpretation, since it comes about when the reader brings an “excess” of meaning to the text, and the text is judged somehow deficient. I've generally been running "joyride" development builds on my XO, and reflashing back to the original configuration every couple days to start experimenting on a fresh base. The re-flashing (this is like Ghosting or cloning a machine for you school IT folks) from USB works well once you get it going, although it seems to take 1-10 attempts to for the laptop to properly detect the USB key, so if you're trying that, be persistent. Anyhow, authenticating to my WEP-encrypted network (yeah, I could turn that off, but I'd have to figure out what the password to log into the AP is first) works well for me in the shipping configuration, less well in newer builds, which seems consistent with this bug report. It is worth noting that this and other outstanding wireless problems may have their root in this meta-bug: wireless firmware not in house. That is, the software that runs the wireless chipset is closed source, for this reason. The upshot is that for the mesh networking hardware to keep moving packets when the rest of the laptop is shut down, it has to run its own little operating system, the one Marvell uses for this purpose is proprietary, and OLPC hasn't finished an open source version of the whole stack yet. So it is one key place where neither OLPC, you or I can fix bugs. They can only ask Marvell for help. Also, handling secure WiFi connections is not a requirement for kids in the developing world using the laptops, at least not an immediate one, so it is unclear how one should evaluate the severity of this bug in general, although it certainly is annoying me. Intel claims that they are quitting because of Nicholas Negroponte wanting them to stop the promotion of the Classmate/Eee to education in third world countries, but I think that the real reason is that Intel does not have a good enough processor for the OLPC project to use as an alternative to the AMD Geode LX-700. Intel has not been able to develop a processor to match the price, power consumption and performance requirements of the OLPC project. Paul Otellini could have looked like a fool at the CES if he had to unveil an Intel powered XO that was performing worse in terms of price and power consumption compared to the AMD powered one. This strikes me as the simplest explanation, given that Intel is first and foremost a chipmaker. I don't think they're making decisions based on personalities, politics or pedagogy. They're making an inexpensive, defensive move to protect market share. They don't really care about what OS or user interface you use, and they don't really want to be in the business of making and selling laptops. Putting out an Intel-XO only made sense if they had a chipset that would jump a generation ahead of the current AMD hardware, particularly in terms of power consumption. It would have to be good enough that they wouldn't get 50% of the XO market, but that everyone would demand an Intel XO and send AMD back to the drawing board for a couple years. Failing that, they're better off pushing their own laptop, because they can tailor the platform to their own chipset's advantages and subsidize its manufacture. I've been revisiting my personal objection to Classmate in general. It pretty much comes down to the fact that I trust the track record and motivations of the OLPC more than Intel, in particular, Intel corporate (as opposed to the Intel Foundation, which is a long story itself). I just have little faith that Classmate would survive much past the point that it killed OLPC. If you think it would make sense for Intel's bottom line to keep it going indefinitely, you're delusional. I would be disappointed if OLPC scaled back the ambition of their software goals and switdhed to a more conventional desktop on the XO hardware platform. But I am also frustrated that people seem to have trouble evaluating the hardware and software separately. As hardware, I think the XO is an unalloyed success. To the extent there are hardware problems, they're primarily driver and firmware problems, so arguably they're really software problems (I'm confused about what's up with stylus input on the "wings" of the trackpad... whether it is a hardware or software problem). Sugar, however, is a raw work in progress. Whether or not the ideas embodied are good ones is an open question -- I think they are -- but there is no question that this software is not done. They had to start shipping laptops, and they whipped together what they had pretty well, but if you read over the design documents on the wiki even if everything they've deployed worked perfectly, it would only be a fraction of what they imagined, and what they deployed is certainly less than perfect. What happens next is anyone's guess: Sugar is partially or completely replaced? Sugar matures and fills out over the course of the year? Sugar drags the whole project down like an anchor? I'd say it is equally likely that any of those happen. I'm still wishing for a practical student laptop. The ASUS Eee and OLPC XO are exciting, but not there yet. Comes only with a full featured web browser for software? And sells at a price point most parents can afford – let’s say under $200? I'm not sure that weight is realistic. My high-zoot ultra-portable ThinkPad is 3.5 pounds, and the XO is a touch over 3. Asking for 2 pounds seems pretty arbitrary. The XO's power consumption and management are state of the art; not getting 8 hours yet, but that's a software problem. I've got the advanced power management running on mine, and it is pretty impressive. The cpu goes to sleep with the display on and seems to consume very little power. XO handles wireless pretty well; it would be better if it wasn't also trying to do the crazy mesh stuff. XO handles drops better than anything short of a Toughbook. Lots of people are hacking their XO to do less in software; it is only a few commands to make it run a lightweight window manager and Firefox instead of Sugar. It has a great, innovative screen for reading without eyestrain. It could be sold in quantity for under $200. So the XO is really very close to what Doug wants in hardware. He mostly just wants less software, which is really easy to provide. So yes, in a very practical, direct sense, the XO is "not there yet," but I think it is also short sighted to think that the next device will be the solution. The potential of the XO as a hardware platform is barely tapped. What's needed is some patience, curiousity, and ingenuity, not hope that the next solution will be the one to emerge perfectly formed. When I do apt-get upgrade from my desktop (via a WET-11), it crashes my wireless access point. It used to be somewhat sporadic, now it seems to be happening every time. I assume it is an ipv6 issue. I keep putting off trying to fix it because I don't remember what the login or password is on my Verizon installed AP, and I don't relish trying to wring useful information out of their website. As far as a mechanism for selecting a president is concerned, you might end up with Iowa's model if you set out to design a system that discouraged participation and violated basic democratic values. Perhaps not so different from the US, after all. Every year will be bad for Microsoft's ed-tech market share, but it is looking like a long, slow decline. Including simple instructions for swapping in the fix (replacing chat.py) if you don't have a developer key. I took a look at the OLPC Human Interface Guidelines with an eye toward Sugarizing the GNota gradebook. What I realized was that to do this right, I'd need to switch from using a database (sqlite) backend to a document-centric system focusing on the Journal. Basically, what you want is for the teacher's journal to contain one XML document for each student with all their assessment data. That way the built-in security and document sharing machinery can be used, instead of having the Activity trying to pull data selectively from a database. I should be able to pull this off, although the documentation is still minimal, and I'll have to learn some dbus-fu, which seems fairly intimidating. I just impulsively restarted ejabberd on xochat.org. We were up to 70% memory consumption, and in particular I know I've only been seeing a few of the people on my neighborhood view who are actually logged in (based on the stats on the server's web interface). Restarting makes everyone go away, and it seems that you have to restart Sugar (ctrl-alt-erase) to re-load (and re-add yourself) so people are slowly coming back. Ivan Krstić has offered me space on a vastly more capable server than I've got now, so we should be moving xochat.org some time this month. I'll keep you posted once we work out the details. Aside from the "Hey, look at all those colorful little people I can see" factor, online collaboration via Sugar on the XO is a bit underwhelming in practice. There are a couple things to keep in mind, though. First off, there is no question that collaboration in particular is way buggy and inconsistently implemented. The chat client has a harsh scrolling bug that makes is essentially unusable in the stock build (that's what happens when you decide to use an immature canvas object as a cornerstone of your UI), Write tends to crash when you switch to another activity, etc. That stuff will be fixed. On the other hand, connecting with "the world" via a central Jabber server like xochat.org just isn't the use case Sugar was designed for. Each school will have its own Jabber server. Eventually, students will probably be able to view students from multiple servers. This capacity is built into Jabber ("s2s") but not implemented in the Sugar UI. Regardless, however, if you're talking about collaboration within a school, and probably a small school by US standards (under 500), you can make a big assumption that one doesn't make about collaboration over the internet in general: that you can assume a lot of "out of band" communication, that is, the kids have ample opportunity to meet and discuss things face to face in addition to via the computer. So when a kid is, say, sharing a document, it is pretty likely that he or she has discussed it with the students he or she will be working with, and they're expecting it. This is important because when simply sharing a Write document, it is only available via Jabber (or the mesh) while it is being edited. Compared to a wiki, this is a bad strategy for internet scale collaboration. Inside a classroom or a village, it makes more sense. Notification seems to be a big weakness of Sugar right now as well. For example, if you decide to join a random shared Activity on xochat.org, it usually seems like nobody is home. That's because the person sharing the activity has probably gone on to doing something else, and doesn't notice you've arrived. Or you invite someone to a chat and they don't know it until after you've given up. This is because the only notifications come in the lower left hand corner of the frame, which is not visible while you're working in an activity. This is by design. You want kids to collaborate, but you also don't want them able to constantly distract each other. I think unobtrusive notification is a good choice for the main use case. It just doesn't work so well if you're trying to find someone to play Connect Four with. We change the Course of Study about every ten years. But the truth is that ten years is too short a time to change classroom education. If we greatly changed the Course of Study every ten years, teachers would be turning their heads this way and that so often that their necks would break. So we make major changes in the Course of Study only every twenty years or so, and in between it's just fine tuning. ...I keep seeing stories go by about governments liking Open Source and Open Data Formats, often confusing the two laughably, but still, it’s a real trend.